・Welcome to use Credit Card or PayPal for payment. ・Delivery fee will be included for system directly. Relaxes tendons and invigorates channels. For neck pain, back pain, shoulder pain, joint pain, knee pain, sprain, muscular pain, sports related injuries, etc. 1.Find the most uncomfortable or painful spot by pressing around the affected area with the thumb. 2.Peel off protective plastic backing, apply the Herbalgy Easy Analgesic Plasters on the pain spot, once a day. Recommend to apply for 2 – 4 hours each time. If condition persists, repeat Direction 1 & 2 every 12 hours. Consult a Chinese medicine practitioner or seek advice from doctor before the use of this product by children, women who are pregnant of breast-feeding. Avoid contacts with eyes and mucous membranes when in use. FOR EXTERNAL APPLICATION ONLY. Do not apply on skin ulcer and purulent skin. If irritation develops or condition worsens, discontinue use immediately and seek medical attention. Avoid to use products containing methyl salicylate in children who have a flu, chickenpox or fever. People who are allergic to salicyclic acid should consult a Chinese medicine prctitioner or a doctor before using this product. 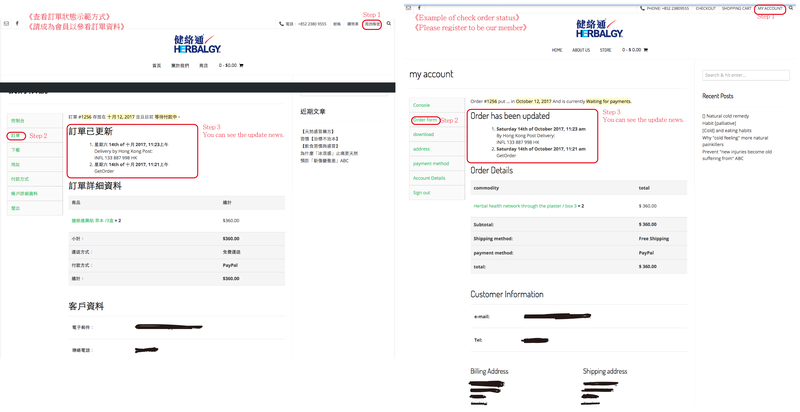 • When you complete your order and payment, you will receive an E-mail notification to re-confirm the address and personal information acount, you can also confirm the delivery details through the [Order] . • We will notify you by EMAIL. • Please note that the way of post will affect the delivery time. • The product is supplied directly by the manufacturer. If there are issues of remoteness, or other special circumstances such as natural disasters or poor road conditions, resulting in the logistics vehicles cannot reach under normal conditions, we will not refund. • Your order will be sent out within three working days. Our working days are from Monday to Friday. • If you find any problems with the product like defects or errors, please contact us within seven days upon goods received. • Delivery method: By air, surface or registered mail. You will receive the product within three months depends on way of delivery. *** For customers’ reasons such as the wrong address and phone number, Herbalgy Online Shop will recourse the extra delivery fee in the first time and resend the mail. As a result of customs clearance delays or confiscation of goods , the company will not refund the shipping cost and will not be responsible for its related losses.